Health may be correlated with income and Virginia may have the ninth-highest average household income among the 50 states, but the Old Dominion ranks 23rd in the nation for the incidence of diabetes, according to a Gallup-Sharecare report based on 2017 data. 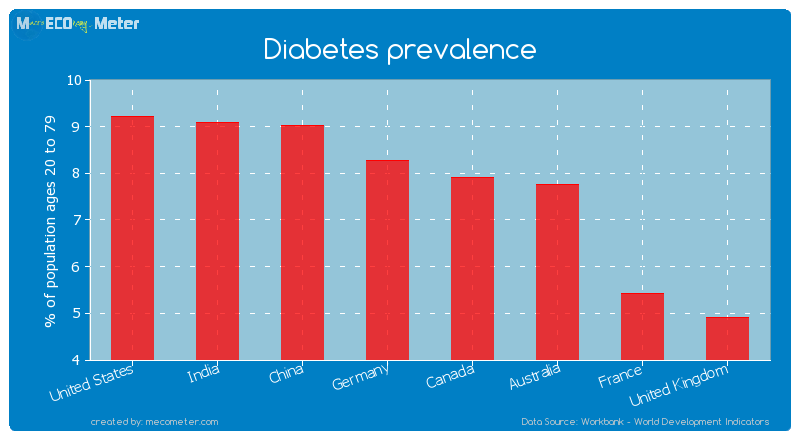 The incidence of diabetes has increased from 10.6% of the population to 11.1% since 2008-09. Meanwhile, in a parallel development, the incidence of obesity has risen from 25.1% to 27.3%. The survey covers the 186 largest metro areas in the country. The spreading prevalence of diabetes is distressing news for those afflicted by the disease. And, given the socialization of medical costs by means of government programs and innumerable subsidies and cross-subsidies, it is distressing for all of us who have to pay for it. If the diabetes rate had remained at its 2008 level, about 2.3 million fewer U.S. adults would have the disease today, and healthcare costs due to diabetes would be an estimated $19.2 billion less than current costs. Diabetes not only impacts the U.S. economy through direct costs, but also through lower employee productivity due to unplanned absenteeism. After controlling for all major demographics as well as BMI weight class, over 57 million additional unplanned days of work are missed each year by workers who have diabetes as compared to workers without diabetes. This costs U.S. employers $20.4 billion annually. Diabetes represents both a problem and an opportunity for Virginia. Medical costs weigh heavily upon the state, creating a major economic burden. Conversely, successfully targeting diabetes could reap an economic boon. Bacon’s bottom line: I have become acutely attuned to the perils of diabetes since I was diagnosed with pre-diabetes a year ago. My glucose level has not risen to a dangerous level, but it’s been bouncing around in the undesirable zone. Since getting the unwelcome diagnosis, I have made tremendous efforts to take control of the situation. I’ve lost about 12 pounds and kept the weight off. I have altered my habits and routine to get more exercise (not a terribly hard thing to do because I enjoy exercise), and I have cut my carbohydrates (a very hard thing to do because it has meant giving up milk shakes and french fries). If I can do it, so can others. And if others don’t do it, I get miffed. While there may be a genetic component to the disease, diabetes is largely the result of behavior. Why should I pay more in taxes and health insurance because others don’t make greater efforts to take care of themselves? Our system of health insurance creates a moral hazard — it does not punish poor habits or reward good ones. I don’t know how we, as a society, lick this problem. Treating diabetics like smokers and charging them more for insurance does not seem like a humane solution. But something has got to give. If you want to really cheer up, think about this – the growing evidence that insulin resistance, the process at the heart of Type II diabetes, also has a link to cognitive issues. Some call Alzheimer’s Type III diabetes. So we also have this going on in our future. It was on a trip to the midwest more than a decade ago, when my son was stationed near St Louis, that I started calling the United States “Land of Giants” due to the prevalence of obesity out there in the corn fields. See MO on that map. Glad you got your warning in time, Jim. Sugar really is a poison…. speaking of cognitive issues – is there any correlation between type II and Red States? I don’t know of another place on earth that denies health insurance based on bad habits….. and trying to differentiate between some folks who have really bad habits and really bad health and those who have not the best habits but genes that predispose them to health impacts more than others – like proverbial guy that smoked or was fat his whole life but still got to be 100 while the gal who was genetically predisposed to a disease that she got even though she was not really obese or only smoked a little, etc. The productivity issue also points out those in the working class who rely on govt help for health insurance can, without it, become 100% entitlement takers. A major part of our health care costs in this country is – diseases than can be managed – not screened and not managed… that then cascade into heart disease, organ failure and amputations – that we do not deny people treatment for – no matter the cause of it. Last week I bumped into an exciting medical article talking about potential new treatment or cure for Type II (breakthrough?). It appears the skin lining the small intestine could be part of the cause of Type II. However, it is relatively easy to remove the old skin and get new skin to grow on the internal side of the small intestine. This is accomplished by snaking a surgical balloon down the throat to the small intestine, and then they fill the balloon with hot water to kill the old skin. Those treated are apparently instantly improved/cured, and so far 1-year later they are still doing well!! @Tbill – yeeeechhh!! what happens if new skin does not grow back! have you got a link to an article? the impression I have got is that diabetes is pretty complicated and it involves the pancreas failing to produce enough insulin and there is an entire industry of drugs and insulin products that are very profitable for the industry. Well, we know your understanding of medicine is just as high as other topics, Larry. Type I and Type II diabetes are different. The problem in Type II is insulin resistance and the inability of the body’s natural systems to regulate sugar – sugar which is often there in overabundance because of the high-sugar food and drink too many of us imbibe on a daily (hourly) basis. The body pumps out insulin but it doesn’t do its job anymore. Type II is a preventable condition, whereas Type I is not. As Steve mentions, Type-II is insulin resistant diabetes. But you are correct that $billions of dollars are potentially at risk for drug companies. I recall when it was discoved that bacteria H. pylori caused ulcers (Nobel prize winning discovery), there was tremendous outrage from the drug companies who suggested that was bad science because it had negative implications for drug (eg; Tagamet) sales. Can you imagine the impact if the Type-II could be cured as described above?